Coriander is an annual herb (Coriandrum Sativum) of the parsley family. 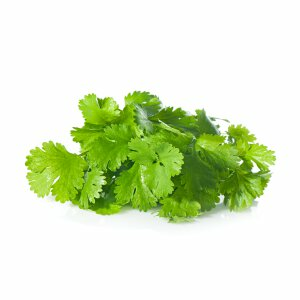 The green leaves are called cilantro and are used in cooking as garnishes. The seeds are harvested as a spice and are either ground for flavoring or extracted for oils. This oil contains vitamin A and C, riboflavin, vitamin K, folic acid, calcium, iron, magnesium and potassium, and traces of niacin, vitamin B6, phosphor and zinc.